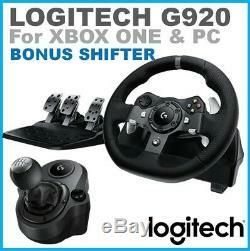 Logitech G920 Driving Force Racing Wheel Pedals & Shifter for XBOX ONE PC. 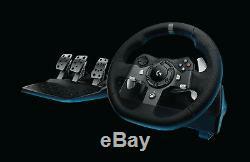 You will never want to race with a regular controller again after you add Driving Force to your controller selection. G29 game steering wheel is designed for the latest racing games for your XBOX ONE & PC. Recommended for use with the world's best gaming cockpit - Trak Racer. Perfect fit for the Trak Racer Premium Racing Simulators. The input voltage of this product is 100-240V50/60Hz. If you are not located in Australia/New Zealand you will need an inexpensive adapter. Realistic console experience Driving Force is designed for the latest Xbox One console racing game titles. You may never race with a regular controller again after you experience G920 Driving Force. G920 Driving Force also works on PC with select titles using Logitech Gaming Software. Experience every tire slip, brake fade and weight shift Feel your tires on every turn and type of terrain, sense under- or over-steer drifting. Powerful dual-motor force feedback realistically simulates force effects for precision response. Race-ready materials that can handle it all Driving Force handles the stress of racing action and is built for long-lasting reliability. Solid steel ball bearings in the wheel shaft and stainless steel paddle shifters and pedals make G920 the long-distance race wheel. Its covered in high-quality, hand-stitched leather, with the look and feel of a high-performance racecar wheel and it gives you a more comfortable, durable experience. Precision control Helical gears are modeled after gears used in automotive transmissions to reduce unwanted noise and vibration. Anti-backlash keeps the wheel and pedals tight, maximizing your control. This steering wheel delivers exceptionally smooth, quiet steering action. Control where you need it Get even more control over your cars setup. G920 Racing Wheel incorporates the D-Pad and console buttons into the wheel so all your controls are right where you can reach them, while the semi-automatic paddle shifters help you execute smooth, accurate gear transitions on hairpin turns and straightaways. Adjustable for maximum control Maintain a more realistic driving body position with the separate floor pedal unit with integrated throttle, brake, and clutch pedals. G920 Driving Force lets you comfortably accelerate, brake and change gears with the feel of an actual car. The nonlinear brake pedal mimics the performance of a pressure-sensitive brake system for a more responsive, accurate braking feel. For even finer control, reposition the pedal faces to make heel-toe maneuvers easier to perform. Rubber feet for hard surfaces and a patented retractable carpet grip system help your pedals stay right where you put them. Performance that stays where you want it Drive fearlessly knowing the wheel wont shift during aggressive maneuvers. 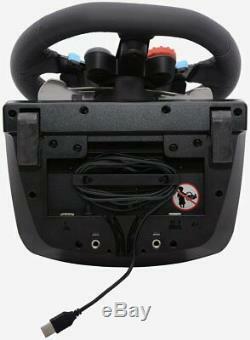 The racing wheel mounts securely to your table or racing rig via built-in clamps or screw mounting points. Take your racing to the next level with a Playseat® racing simulation cockpit. For realistic turns on the track The 900-degree lock-to-lock rotation of the G920 Driving Force means you can turn the wheel around two and a half times, hand over hand on wide turns. Its the same degree of motion as a steering wheel inside a car. Stay oriented in the right direction Easily see if your steering is dialed in using a visual cue within your peripheral vision. The steering wheel stripe is a visual indicator of which direction the wheel is pointing. WORKS WITH DRIVING FORCE SHIFTER ATTACHMENT. Pinpoint gear selection Complete your racing rig for the most realistic experience. 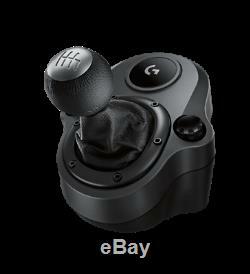 Add the 6-speed manual Driving Force shifter to your racing wheel setup. 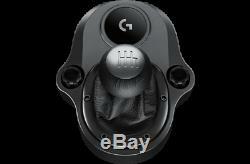 DESIGNED FOR G29 AND G920 DRIVING FORCE WHEELS. Lock in the right gear at the right time. 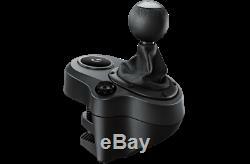 Driving Force Shifter is designed for both G29 and G920 Driving Force racing wheels, to enhance the latest PC and console racing titles. Add Driving Force Shifter to your racing wheel setup to complete your racing rig for a more realistic experience. Race comfortably and with confidence With a solid steel gear shaft, Driving Force Shifter is built for precision racing and long-lasting reliability. The knob and boot are covered in high-quality, hand-stitched leather, giving it a look and feel similar to a high-performance race shifter and giving you a more comfortable, durable experience. SIX-SPEED SHIFTER WITH PUSH-DOWN REVERSE. Maintain acceleration through every gear The six-speed H-pattern shifter moves fluidly and solidly clicks into each gear, helping you execute smooth, accurate gear transitions on hairpin turns and straightaways. Wont shift while youre shifting Durable built-in clamps allow Driving Force Shifter to be mounted securely to a table or racing rig to minimize shifting or wobbling during aggressive race maneuvers. Windows® 8.1, Windows 8 or Windows 7. Powered USB Port Internet connection and 150MB hard drive space (for optional software download) Games that support Logitech® force feedback racing wheel. Height: 270 mm (10.63 in). Width: 260 mm (10.24 in). Length: 278 mm (10.94 in). Weight without cables: 2.25 kg (4.96 lb). Height: 167 mm (6.57 in). Width: 428.5 mm (16.87 in). Depth: 311 mm (12.24 in). Weight without cables: 3.1 kg (6.83 lb). Height: 206.5 mm (8.13 in). Width: 176.4 mm (6.94 in). Depth 146.4 mm (5.76 in). Weight without cable: 0.72 kg (1.59 lb). Weight with cable: 0.76 kg (1.66 lb). Software Support (at release): Logitech Gaming Software. USB Protocol: USB 2.0. Designed to work with G29/G920 Driving Force Racing Wheels. Six speeds with push-down reverse gear. Steel and leather components for comfort and durability. Mounts securely to a racing rig. Shifter paddles: Brushed stainless steel. Pedal frames and arms: cold rolled steel. Pedal faces: Brushed stainless steel. Pedal piston sleeves: Polyoxymethylene thermoplastic (POM). If we anticipate a longer lead time, it will be noted in the item description or you will be advised before we dispatch your order. Required by your country for importing consumer goods. We do not collect this beforehand, and can't give you an estimate of the cost, because it varies widely around the world. We will be happy to remove the signature requirement on request; please contact our team before purchasing for details on what you require. Please note that, in this case, you will be accepting responsibility if anything were to happen to the package. We will take all the required precautions to pack your item well to avoid any incidental damages along the way. Today, there are over 15 staff members across 4 countries focussing on Engineering, Support, Marketing, Accounts and Sales. Drop by and say hello. Our opening hours are Monday to Friday however, exceptions may be made to meet you there on a weekend. Since 2009 Masten Engineers have been at the forefront of vehicle electronics for both OEM and Aftermarket. We maintain critical spare parts so in most occasions, parts are on hand and ready to solve your issues within a timely period. If we don't have the part in stock, in most cases we can get it in for you despite the product's age. If you have any questions please dont hesitate to get in touch with our Support team who are here to help. We don't take ourselves too seriously; until it comes to quality! We're ultra-selective about the electronics, materials, manufacturing process, quality control and finishes of every product. Put simply, we only sell the best. 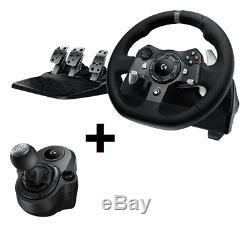 The item "For XBOX ONE & PC Logitech G920 Driving Force Racing Wheel Pedals & Shifter" is in sale since Monday, March 14, 2016. This item is in the category "Video Games & Consoles\Video Game Accessories\Controllers & Attachments". The seller is "digoptions_worldwide" and is located in Brunswick East. This item can be shipped worldwide.